You have the plan in hand, you’ve hired a contractor and now the day for beginning your remodeling project is quickly approaching. You need to clear the kitchen and organize the contents so that you and your family can have access to what you need with ease while the remodel takes place. If this seems overwhelming, follow these steps to simplify the process. Gather supplies. You will need boxes or reusable storage bins, newspapers, packing materials, packing tape, quart and gallon size clear plastic storage bags, and markers for labeling. Avoid packing everything into one big box and having to dig through it later; use as many small 1.5 cubic foot boxes/bins as possible until you start getting to the larger and bulkier items such as pots, pans and platters. Pull out items that you use every day such as the coffee maker, tea kettle, pots, skillets, rice cooker (a remodel lifesaver, especially when it comes with a vegetable steamer compartment), plates, bowls, cups, mixing bowls & cooking utensils, can opener, vegetable peelers, eating utensils. During the course of the remodel you will need these essentials. You can also use disposable/compostable cups, plates and dinnerware. Set aside storage containers for leftovers, food storage bags, foil and plastic wrap, lunch sacks. Also, make sure you have dishwashing and cleaning supplies on hand. Pack eating utensils in gallon size zip-lock storage bags. Use a bag each for knives, forks and spoons. 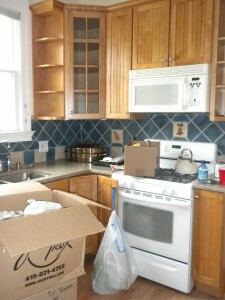 It will make it easy to access, and unpack these items once the kitchen is finished. Do the same with cooking utensils and small gadgets. Store utensils and gadgets in their own small box. Pack glassware and dinnerware carefully. Even though you are packing these items for a short period of time, things can get broken in the process of carrying, stacking and storage. Wrap fragile items in newspaper or bubble wrap to protect them and seal your boxes with tape. Top the box with extra padding so the topside doesn’t sink down when the weight of another box is stacked on it…this can cause boxes to tumble and fall. Mark contents on the outside of each box. Pack canned and dry foods in categories such as breakfast food, canned goods, sauces, pastas, spices, baking supplies, drinks, cooking oils, and pet food. Use small and shallow boxes to keep things organized, upright, and at-hand during the construction activity. Double check that tops are screwed on tightly before packing bottles and liquids upright. Collect items you use infrequently such as holiday dinnerware, specialized bake ware, punchbowls, platters. Pack, mark and store these items in a closet, basement or garage. Keep like items together when clearing out your cabinets. It’s worth taking the time to organize things now and prevent frustration later. Set aside things you don’t use anymore for donation. Make a list and estimate the value before you take them to your local donation center. Throw out anything broken or unusable such as old plastic storage ware. This is a great time to reduce clutter. Pack up cookbooks and recipes in their own box. Take down blinds, curtains, rods and wall decorations. Place the hardware in clear plastic storage bags and label with a marker directly on the bag. Clean and dust these items if you will be using them again in the remodeled kitchen. Cover computer and electronics to protect from dust. You may also want to cover furniture in adjacent rooms that may be affected by dust from the construction area. Take down valuable pictures and wall hangings in adjacent rooms that can be knocked off the wall or damaged during the remodeling process. Protect your pets. Keep them away from the work area. Dogs and cats can be a danger to themselves and the work crew if they are underfoot. The best option is to keep them in a closed room away from all the work. You can also hire a pet sitter to look after your pets during an extensive remodel. READ MORE BELLA ORGANIZING TIPS, IDEAS & TRAVELS HERE. Isabella Guajardo, also known as Girl With A Truck™, is a professional home organizer and a member of the National Association of Professional Organizers (NAPO). Living in Oakland and Monterey, she travels in her truck to work with clients throughout the SF Bay Area, East Bay, South Bay, Silicon Valley, Santa Cruz and Monterey Peninsula. She shares simple and creative ways to stay organized and stylish while reducing, recycling and re-purposing. Join Bella Organizing on Facebook. Gift certificates are available. Call (510) 229-7321 to schedule a complimentary telephone consultation.